I knew it had to be our next Punky Book Club pick. The book is graphic heavy, making it a quick read. By the time I had reached the last page I felt that not only did I feel connected to this gal who willingly displaying some profound life moments, but I now had a handy dandy book to shove in people’s faces instead of trying to explain anxiety. Why reinvent the wheel? I was blown away by Brosh’s talent. She is capable of taking the worst situations and weaving a safety blanket of understanding and humor that you will want to share with everyone. How does she make her simple characters so expressive? Her story, Depression Part One and Two, takes you through her experience with depression. It’s raw and not the syrupy, in fact, she covers how absurd it is for people to suggest overly simplified solutions. She understands that people are coming from a place of love, but sometimes you can’t just yoga your way happy. Depression is more than being sad. My favorite story in the book was Thoughts and Feelings. I, too, am guilty of being unreasonable upset when reality doesn’t conform to my arbitrary expectations. I mildly resent the fact the imaginary researcher seems to disagree with Allie and I. I fully believe that our withering glare is able to simulatanrously punish and cause the offending object to alter it’s behavior. It makes me feel better! 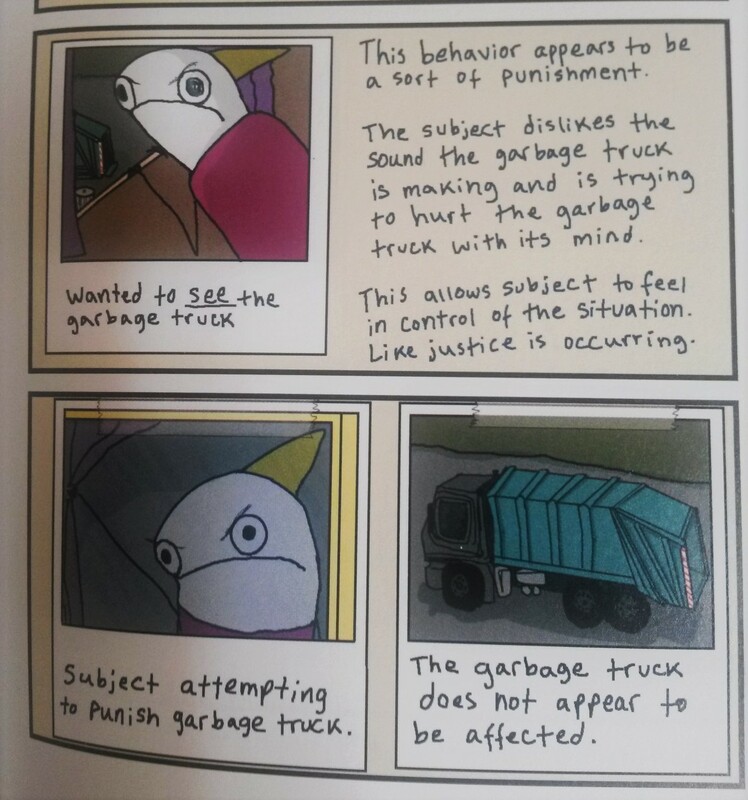 The book Hyperbole and a Half isn’t just about questionable coping mechanisms. It’s also about rescue dogs, pinecones, and demonic duck attacks. I highly recommend it. Have you joined our book club? P.S. Tell me I’m not the only that didn’t realize the yellow triangle was her ponytail and not a strange crown. WANT TO FIND OUT THE NEXT SELECTION FOR BOOK CLUB?